Today we kick-off our first ever DietBet 10 Game! We’ve coined our game: Commit to YOUR Fit, and if you haven’t signed up yet, don’t worry. You’ve still got today, and you can technically sign up for the next 2 weeks for our game. But why would you want to wait? What is a DietBet, you might ask? Well, it’s a fun way to lose weight and win money. It’s kinda like a virtual cookie jar that we all throw our money into as we pinky swear to lose weight, and whomever meets their goals, gets to split the pot with all the other winners. Sounds awesome, right? And yeah, there aren’t any cookies in said jar, because, um…..cookies? So everyone who antes up, submits their weigh-in photos to DietBet, who makes sure it’s all legit, and then it’s *ON*. We work for SIX months to lose 10% of our body weight, and each month that we meet our mini-goals, we win money. And at the end, if we meet the final 10% goal, there a big ole pot of gold, I mean cash, just waiting for us at the end of the skinny rainbow. And the best part? It’s FUN! I know, right? Why wouldn’t you want to join!? And also, we’re master coaches for DietBet, so we’ve been doing this for awhile, and can attest to it’s awesomeness. So run, don’t walk, and JOIN OUR DIETBET TODAY! As a little bonus and incentive, if you join our game TODAY, you’ll be eligible to win 25 in weigh-in tokens, that can be used for extra credit weigh-ins and prizes during the challenge. You can use the weigh-in tokens to submit your weight to DietBet once a week (or more often) to help keep yourself accountable and on track. DietBet has some pretty awesome weekly prizes for people who use token weigh-ins, too. 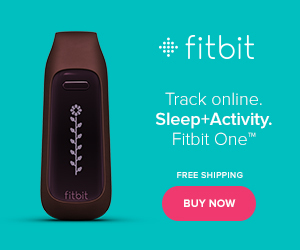 Things like Withings WIFI scales and FitBits! Pshaw! So, to reiterate, if you register TODAY, you will be eligible to win 25 weigh-in tokens, a $20 value, from the Sisterhood of the Shrinking Jeans. To learn everything you need to know about DietBet 10 games, you can read all the rules here. We’ll have sweet giveaways each month to random people who meet that month’s goal! WOOT!! Amazon gift cards from us here at the Sisterhood of the Shrinking Jeans. 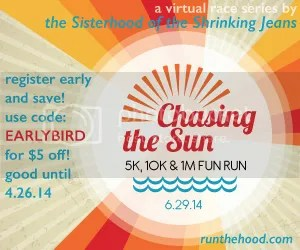 If you’re new around here, please let me introduce you to our virtual race series, Run the ‘Hood! Two-to-three times a year, we host a virtual race, meaning you run your race on your own, where ever you want, on a certain day, and we send you a sweet race t-shirt and custom medal. It’s totally awesome. And something your whole family can participate in. Or your running group. Or your best friends. Or….you get the point. If you’d like to learn more, go check out our Run the ‘Hood site, or you can click below to register now! *disclaimer: as a DietBet Master Coach, we do earn an affiliate fee for hosting games. We are providing monthly prizes, and other incentives during the game out of our own pocket as well. ToiletTree Products and The Sox Box are giving away prizes at no cost to us, and did not pay for that privilege. The end.